Come on out so you can see what we have done so far. 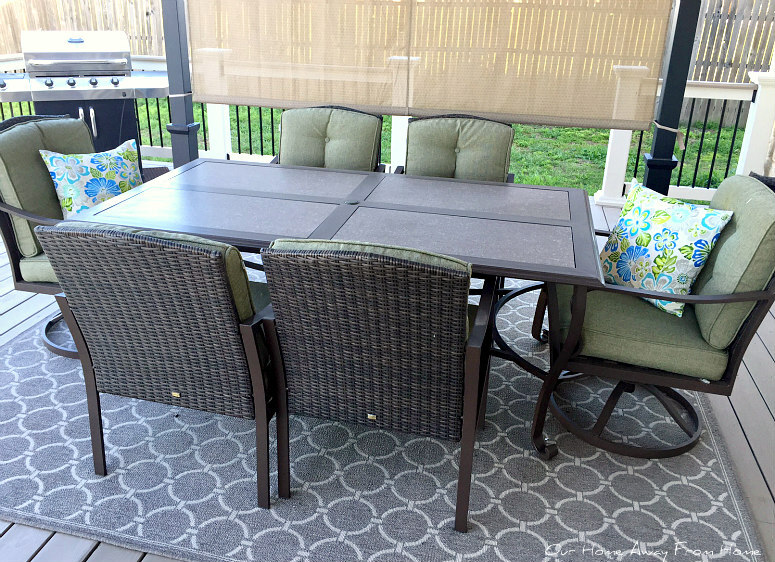 We bought the dining table and chairs last year when we purchased the porch seating set. Both sets are from the same La-z-boy collection and we kept it all stored until the deck was finished. About three months ago we bought the pergola at Lowe's. 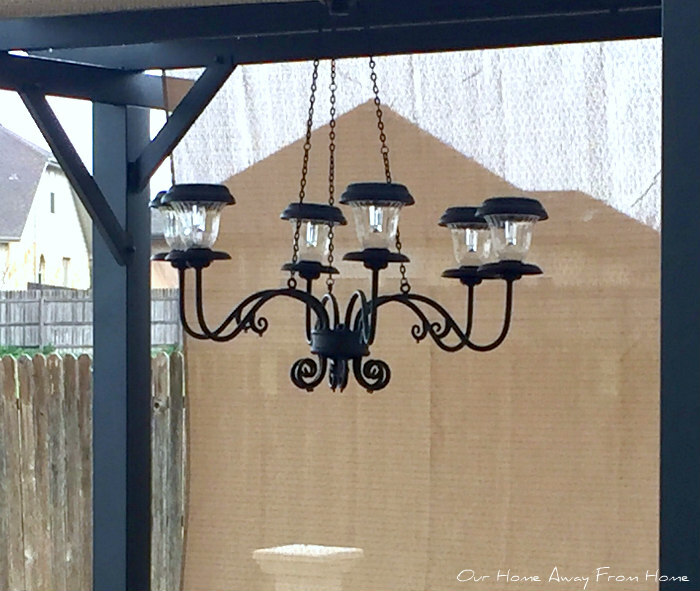 And a couple of weeks after we found this brand new wrought iron chandelier at our local Habitat center for $10.00 and turned it into a solar chandelier for the pergola. It is nice to see it light up on its own every evening when the sun goes down. At the beginning of Spring, I made some new pillow covers. 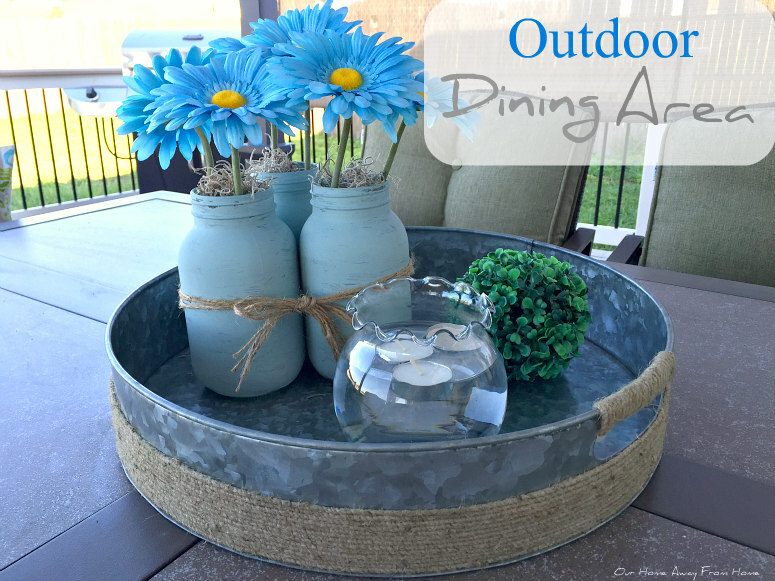 And created a small centerpiece using a galvanized round tray I found at Ross and items I already had at home. I am still waiting to add a runner or placemats until it stops storming every day. And when we thought we were done, I found these. Joann's had them on sale for a while at $8.99 a set, regular $29.99, so I couldn't leave them behind. 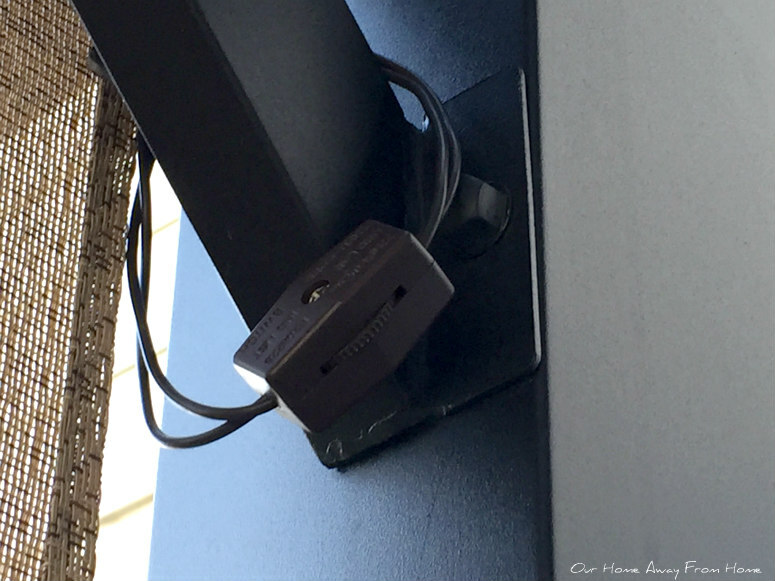 My husband installed a new outdoor outlet on the side of the house, added the lights to the pergola, run an extension cord through the inside of the pergola leg and under the deck and before I knew it, my lights were up and running. He even added to them a small switch to turn them on and off very easily. I just love the ambiance the new lights give the eating area. the fruit of all our hard work. Thank you all so much for visiting and for your wonderful comments. They mean so much to me! M.E!!! 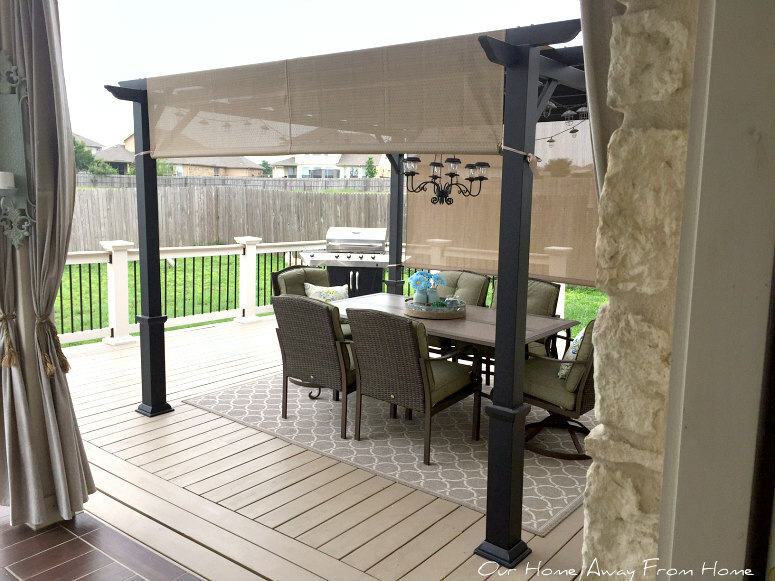 Your outdoor dining area is awesome! Oh I absolutely love the lights, and everything is so fresh and wonderful! 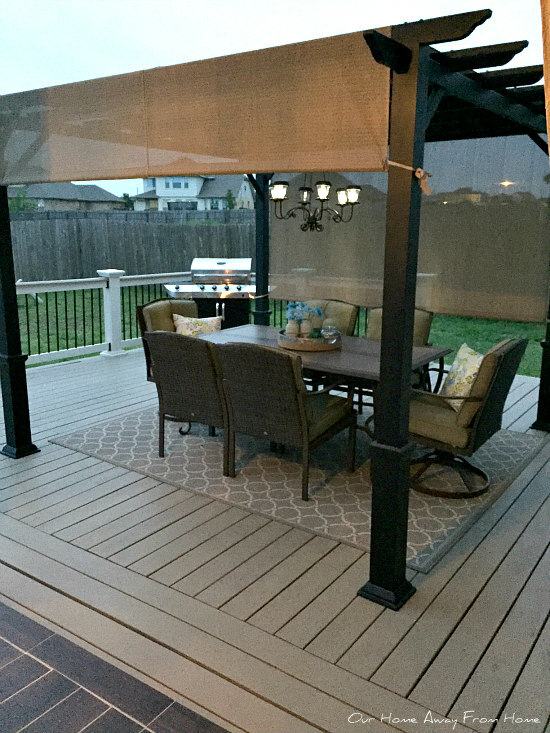 What a lovely way to dine alfresco, Maria Elena! Everything turned out so beautiful and serene! Love it! 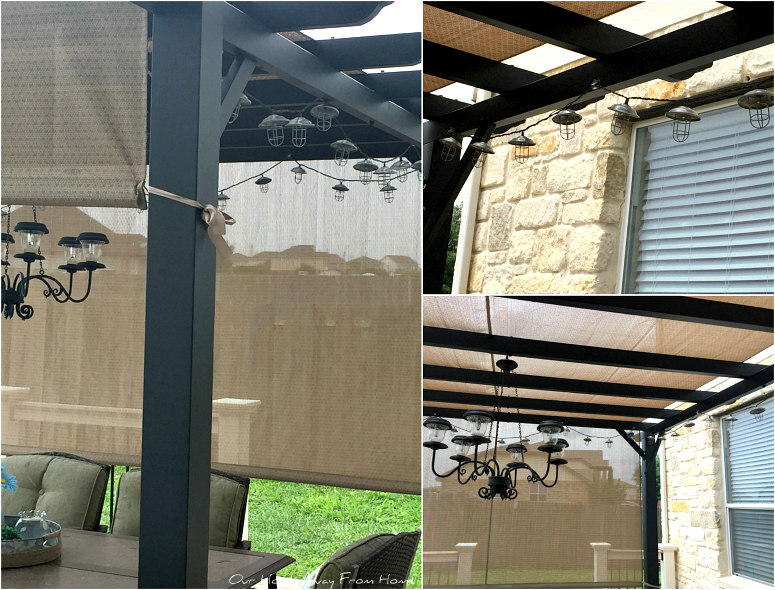 Maria Elena, your outdoor space looks great! I'm sure it beautiful at night, as well. The solar lighting was such a great idea! I bet you are really enjoying your space. It's wonderful! 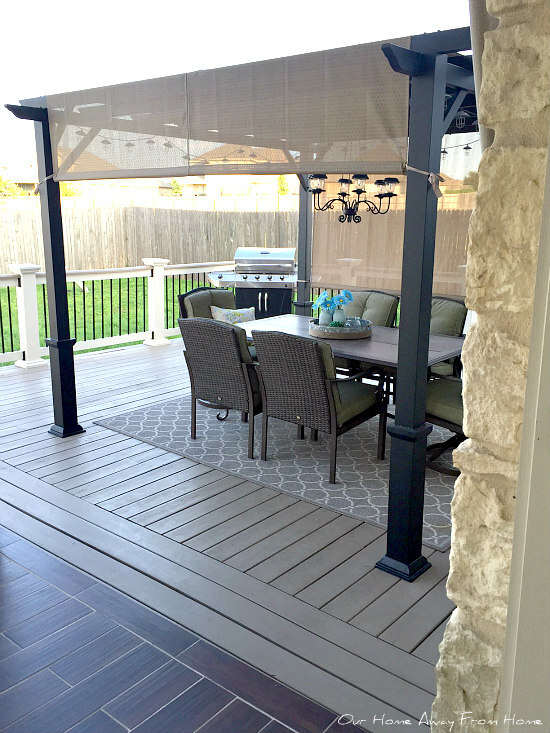 I love your outdoor areas! 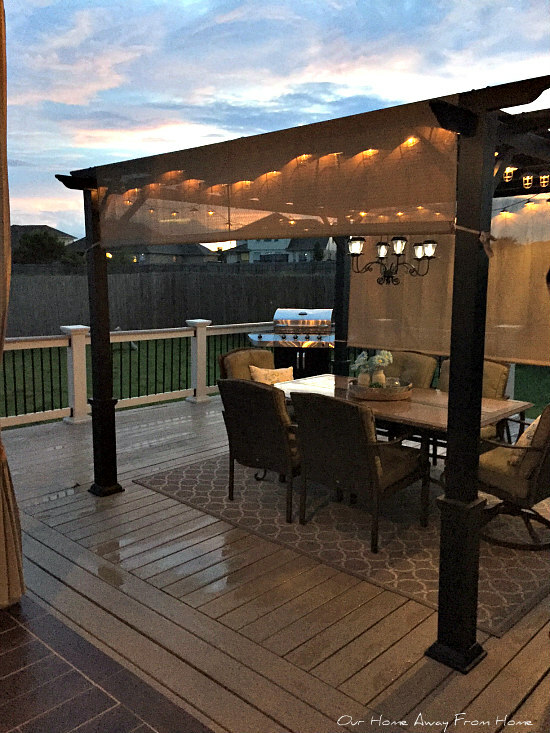 The pergola is so pretty! We have one similar, but our cover is starting to get moldy and old and I'm thinking we should try to replace the cover with one like this. I wonder if we could get a replacement cover for ours. I'll have to look at Lowe's. 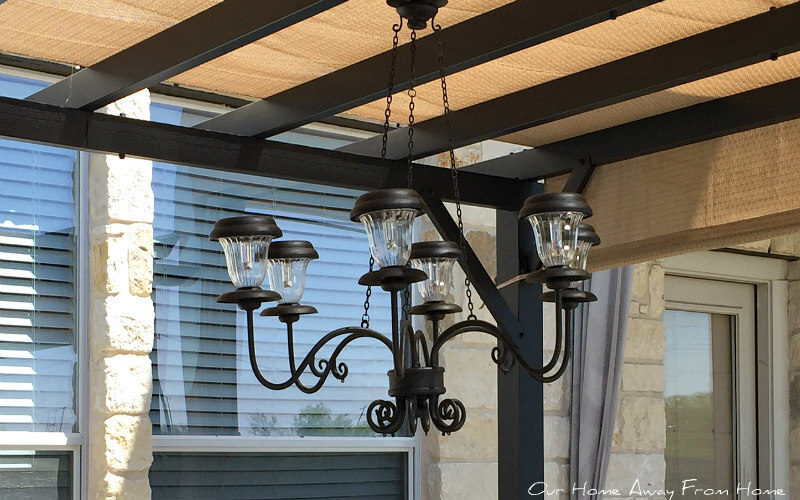 Your lighting is so pretty and I adore the solar chandelier! What a deal you got on it! Thank you Christine! It has been a lot of work but it is finally coming together. 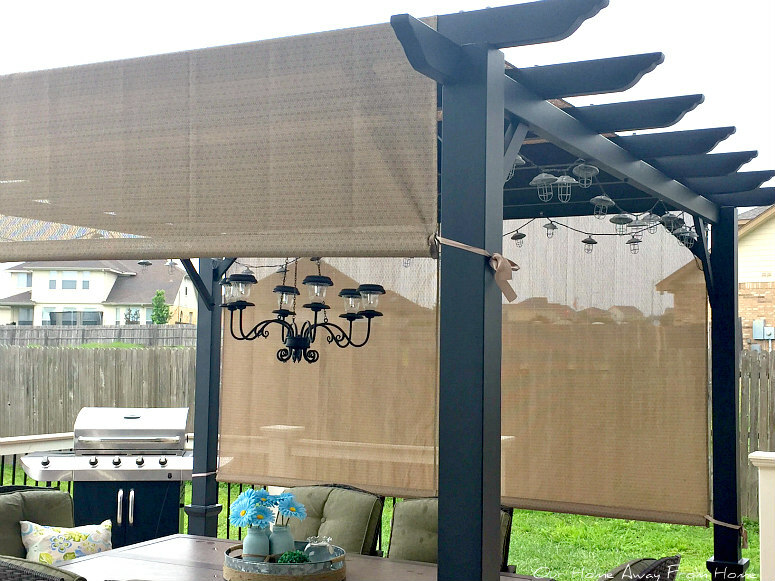 Your NEW Outdoor Dining Ara almost tempt's me to come outside, dear friend! 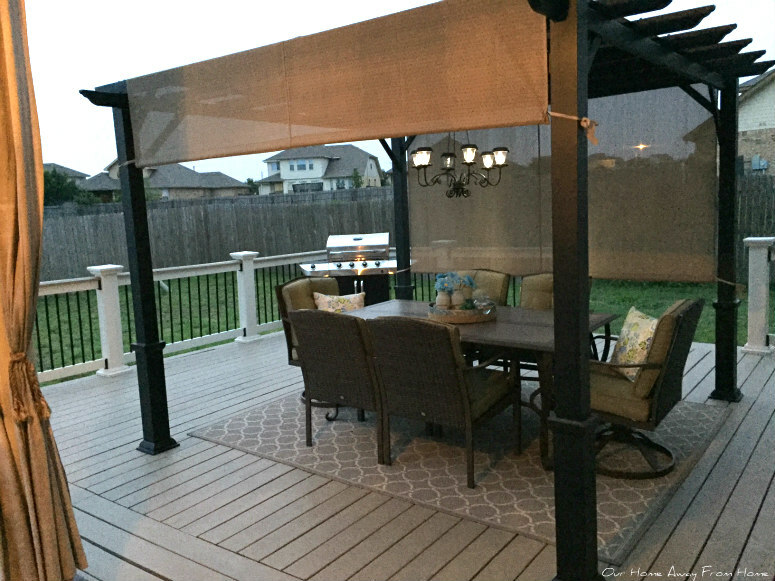 I love the new pergola from Lowe's is a welcome sight in the Summer heat! You guys did a beautiful job on this. Love how you converted the chandelier to solar! 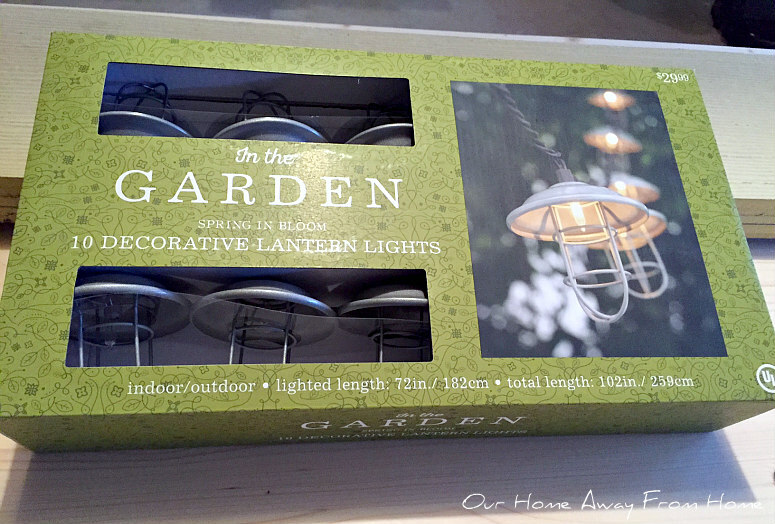 Love the cute accent lights- there are so many cute ones these days it's hard to decide which one to go with! What a lovely space to enjoy the summer months!! I love what you've done!! Just fabulous! I love the lighting you added the most, mine seriously needs a good dose of that! It looks incredible! 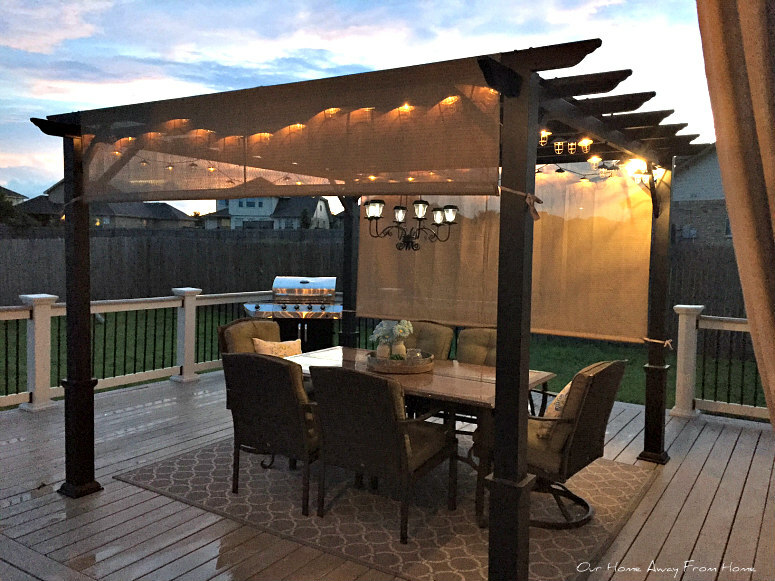 I didn't know you could purchase a pergola; was it a kit? Is it wood or something else? How does it attach to the deck? I am interested in doing something like this!. 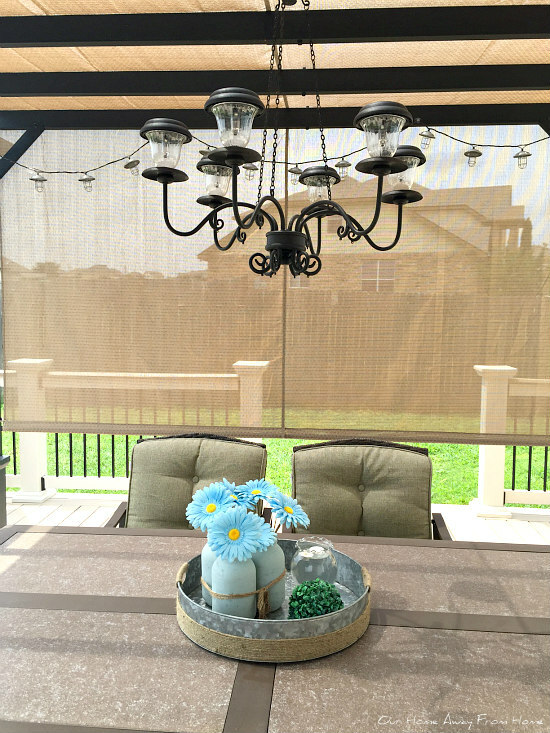 Your outdoor dining area is so pretty, Maria Elena! The chandy is perfect, and I love the galvanized tray. We won't be dining or much of any outdoor things for a few months. The "HEAT" is on, and our temps are creeping into the 115* range but the humidity has been in single digits. I can't seem to slather on enough body cream!